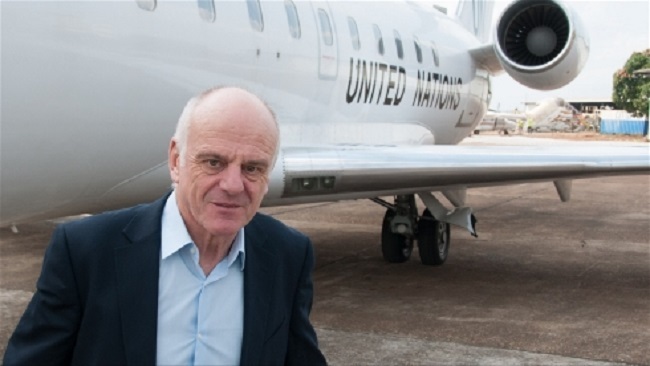 At the height of the Ebola outbreak in September, the United Nations appointed public health expert Dr. David Nabarro as its Special Envoy on Ebola. He was tasked with working with local and international partners and governments to better coordinate and implement Ebola response measures. Six months into his term, Nabarro spoke to IRIN from New York about ongoing challenges and lessons learned. IRIN: How confident are you that this outbreak can be put under control and brought to an end within the next few months? NABARRO: I’m fully confident that it can be done because we know that the strategy has worked. Look at Liberia. But I’m also aware that it requires a lot of people to continue working together without any kind of let-up in their concentration and so my only concern as you would expect is to say please don’t let up now, let’s finish the job. IRIN: It’s been almost one year since the Ebola outbreak was first declared in Guinea. Where do things stand now? NABARRO: The outbreak was at its most intense in September last year, with nearly 1,000 people newly diagnosed with Ebola each week. And then, during December [and] January, the numbers of people newly diagnosed each week reduced towards around 100, but it’s been around 100 ever since the first or second week of January. It’s stayed stubbornly at that 100 level and we are not yet seeing signs of getting to zero throughout the region. free in a few weeks’ time. But the president of Liberia [Ellen Johnson Sirfleaf] believes that her country is not out of the danger zone until all the Ebola cases in all three of the affected countries are under treatment and we have zero Ebola in all three. The current situation is that there is continued transmission in the western part of Sierra Leone and in the coastal regions of Guinea and to a lesser extent in the interior of these countries. IRIN: What are the biggest challenges in getting to zero cases? NABARRO: The communities that are still experiencing Ebola are communities that were not always fully engaged in the response. And what we are finding is that the effort to try to identify people who have been in contact with persons diagnosed with Ebola, what we call contact tracing, is really difficult at the moment in some of these communities where we are working. That’s because the communities are reticent about being involved in the response and our current effort now is to build trust with local communities, so that they are more easily able to get involved in the response. Some communities are very wary of responders coming and asking questions…about what they do and whom they do it with. The key, as our anthropologists tell us, is through negotiations between representatives of responders and representatives of local communities, such as elders and tribal chiefs, so that the involvement of the responders in the community doesn’t come across as sort of an invasion of their privacy. That is super important. Sometimes the negotiation takes several days, but once the negotiation is complete, then entry becomes possible. So finding the right style for incredibly sensitive approaches to contact tracing is another thing we are learning. You might ask why we didn’t know all this before. And the answer is that we’ve never dealt with this on such a huge scale, and the last part of dealing with the outbreak requires detective work that’s intensely personal and requires huge sensitivity. IRIN: Besides building community trust, what are the priorities right now? NABARRO: The five things that I put most emphasis on right now are: One, community engagement; Two, having very good data about where the disease is; Three, having skilled people in the communities who are good at epidemiology, surveillance, and contact tracing; Four, having very good coordination at the local level, so that if new cases are found, it’s possible quickly to work with the communities to find contacts and make sure that those contacts are properly treated; and fifthly, providing very good support to responders that are still very active in the fight, who have been doing this now for months and who are really all the time needing to have help and sometimes have to have intense practical support when they are tired or indeed if they get sick and need to get treated. We’ve had, as you know, quite a lot of health workers in the region who have been infected and over the coming weeks we do want to continue to try to reduce the number of new cases to [get to] zero before the rainy season starts in earnest, which is four to eight weeks’ time. And so we are intensifying our support for governments with case finding and contract tracing right now to really reduce the area that has the disease to the smallest possible number of districts and prefectures in the region. IRIN: WHO’s [Assistant Director-General] Bruce Aylward said this week, something to the effect of, the only thing declining faster than the number of Ebola cases is the money being pledged to combat the disease. Is that true and, if so, what needs to be done to keep donors engaged? NABARRO: We’ve estimated that as an absolute minimum for the UN system from now until the end of July is about US$400 million. We believe that slightly less than half of this is in the pipeline but we are not absolutely sure because this is only based on talking with donors and there is still going to be the requirement to find at least $200 million in the coming months. But this is difficult because money is scarce and there’s a feeling on the parts of donors that the job is done. Actually, that feeling is quite widespread and I have to try to counter this. IRIN: Part way through the outbreak, the UN created UNMEER [the UN Mission for Ebola Emergency Response] to go in and take over a lot of the work that OCHA [the UN Office for the Coordination of Humanitarian Affairs] has traditionally done during crises. How would you characterize the effectiveness of UNMEER and, in hindsight, do you think creating a new body was the right thing to do? NABARRO: When the outbreak was very intense in September, we really did not know how it was going to evolve. There has never been an outbreak of Ebola of this size and severity before. The United Nations did not wish to treat this as a humanitarian crisis. It is a public health crisis with consequences for governments, for economies, for political stability and for people’s well-beings. Very much, the governments have been and are in charge of the response, so there was not a need to come in with alternative government structures. That’s why the United Nations decided to provide an alternative approach for very strong coordination, for intense logistical support and also for political leadership. I think that it’s too early for me to be drawing lessons because I’m so involved in the response. But the sorts of things that are being looked at by others, related to, first of all, systems for ensuring that health personnel can be made available if and when they are needed. Secondly, systems for supporting these health personnel, particularly human resources support and logistics support. Thirdly, financial systems set up in advance so that you don’t have to go and look for money like we’re doing right now because money should be relatively easily available. And fourthly, systems for ensuring that in this kind of crisis we are able to guarantee people’s access to essential services like schooling and health that are safe. I think we are doing okay on that but it’s still quite challenging. We’ve never been in a situation of doing health system revival in an environment where there is a significant risk of a major infectious disease. So all these are new things and the way I want the lesson learning to go ahead is in a way that enables us to prepare for something like this in the future so we don’t have to be actually designing these response systems while we are implementing. But it’s very difficult to do that, so I want to take advantage in the period once the outbreak is over, not just to learn lessons, but to apply them, by developing new systems.